Earlier this week, Colin Marshall highlighted a trove of 3,000 vintage cookbooks on Archive.org, many of which date back to the 19th century. Cookbooks, however, first arrived on the scene well before that. 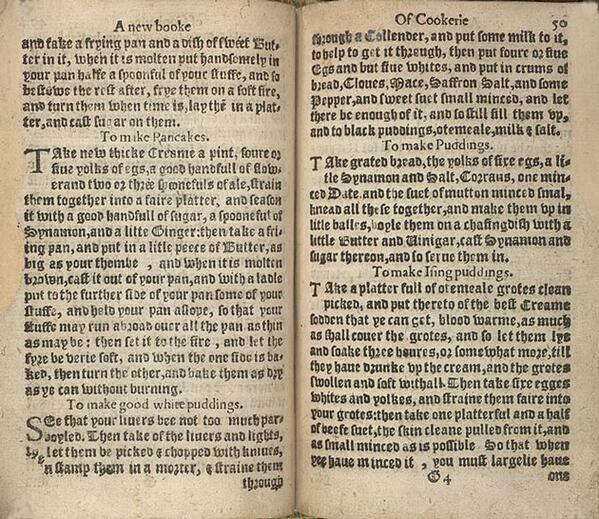 According to the venerable British Library, the "late 16th century was the first time that cookery books began to be published and acquired with any sort of regularity." "It is also the first time that cookery books were directed at a female audience." That is, privileged women who could read and had access to sugar, spices and other then rare ingredients. Take new thicke Creame a pine, foure or five yolks of egs, a good handful of flower and two or three spoonefuls of ale, strain them together into a faire platter, and season it with a good handfull of sugar, a spooneful of synamon, and a little Ginger: then take a friing pan, and put in a litle peece of Butter, as big as your thumbe, and when it is molten brown, cast it out of your pan, and with a ladle put to the further side of your pan some of your stuffe, and hold your pan ..., so that your stuffe may run abroad over all the pan as thin as may be: then set it to the fire, and let the fyre be verie soft, and when the one side is baked, then turn the other, and bake them as dry as ye can without burning. It's Saturday morning. What are you waiting for? Give it a try. The page above also offers recipes for various puddings. Find those recipes transcribed here. It says: “Take new thicke Creame a pint,…” not “a pine,…”. This sounds like a tasty recipe, but more importantly all the spelling mistakes in this book point out just how poorly people were educated back then. We should be grateful for our educational system today. It is my recollection that spelling has changed over the years. Therefore these words are not spelled incorrectly for the time in which they were written. Fascinating recipe! The first book that could be called a dictionary wasn’t published in English until 1604, but spelling wasn’t codified and set the way we think of it today until the 1800s. Before then, spelling varied everywhere, even within the same document, even when written by “educated people.” Have you read the original manuscript of the American constitution, for instance? The word you couldn’t read looks to be “aslope” (in other words, “at an angle”). There’s no rising agent, so I assume this will be a crepe rather than what we think of as a pancake. Addendum: the ale would be a rising agent if it contained live yeast, but not if the recipe was made immediately before cooking. Most yeast pancake recipes suggest making the batter one to three hours in advance, and perhaps the manuscript assumed you knew to do that. Traditionally English pancakes are not made with a ‘raising agent’. It is usually a flat pancake and not at all like what Americans call pancakes but they are also not quite so thin as crêpes. The citation, “Good Huswifes Jewell, given on the link for the recipes, is incorrect. It is from “A good huswifes handmaide for the kitchin”, dated 1588. A handful of flour with 4-5 egg yolks, I am so intrigued by this. Sounds very interesting! Thank you!